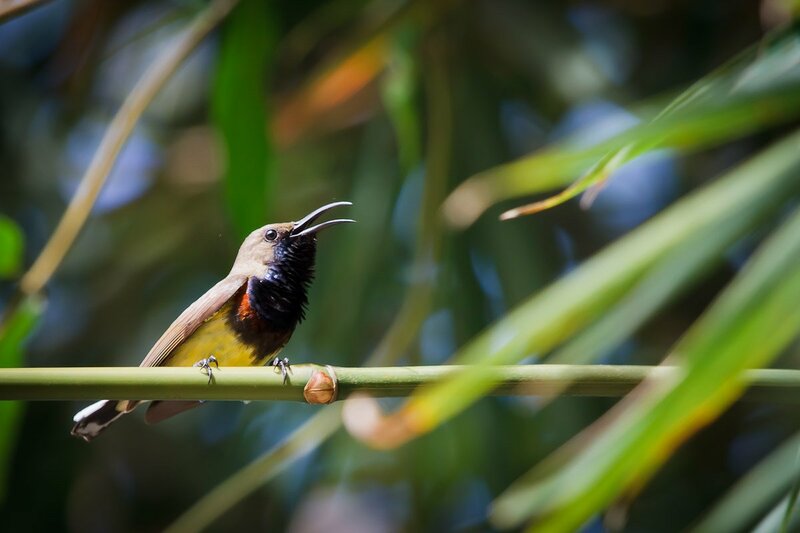 The Olive-backed sunbird, also known as the yellow-bellied sunbird, is a small bird in Nectariniidae Family. They are small in size at around 12 cm long. The under parts of both male and female are bright yellow and the backs are a dull brown colour. 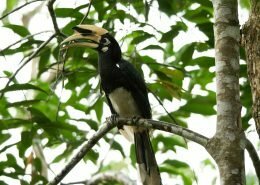 Their forehead, throat and upper breast of the adult male is a blue-black. Their flight is fast and direct on their short wings. 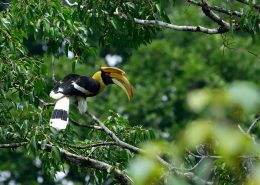 Even though, they are listed as Least Concern by IUCN they are protected in Thailand in accordance with the Wildlife Preservation and Protection act 1992. 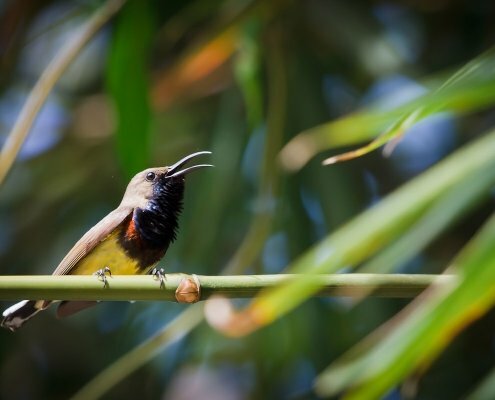 …that The Olive-backed sunbird has a long tongue for feeding on nectar from flowers? They feed largely on nectar from flowers such as Heliconia, Torch Ginger, Saraca and Peacock Flower etc., with their long tongue although they will also take insects especially when feeding their babies. Most species can take nectar by hovering, but usually perch to feed most of time. Normally, they are found in the Old World; Europe, Africa, Asia and Australia and also found in general places such as park or garden, secondary forest, woodland, building & residential area, and road & other urban area. 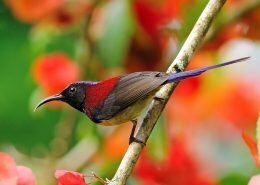 Originally from mangrove habitat, The Olive-backed sunbird has adapted well to humans and now even in densely populated areas, even building their nest in human residences. 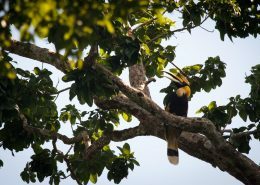 Both of male and female assist in building the nest which is flask-shaped, with an overhanging porch at the entrance, and a trail of hanging material at the bottom end. 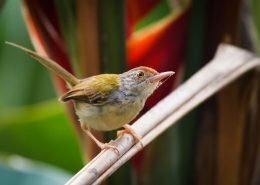 After building the nest, the birds leave the nest for about the week before the female returns to lay 1-3 greenish-blue eggs. The eggs take a further week to hatch. The female may leave the nest for short periods during the day during the incubation (11-16 days). After the chicks have hatched, both male and female assist in taking care of the young, which leave the nest about two or three weeks later.